How to reduce my home's carbon footprint and save money? 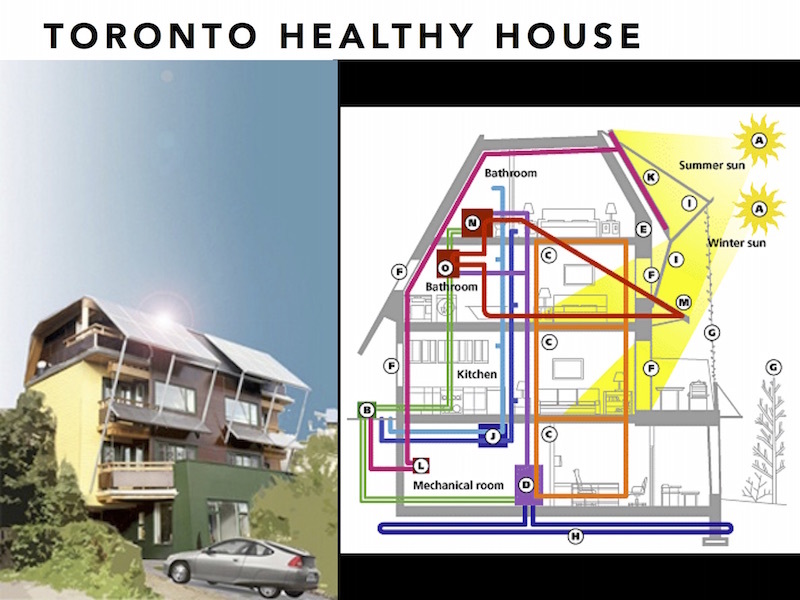 On July 15, 2015 at the request of Toronto Renewable Energy Group and Toronto Green Building Network, I presented my response to the question "How to reduce my home's carbon footprint and save money?" We all know why this is so important, and in fact is now referred to as the greatest challenge facing humanity. I'll skip over the basics like recycling, eating local organics, reducing our consumption, using transit and simply being efficient with all of our energy and resource consumption. We all know this by now and it is the critical first step that we all should be well on our way down the path of in reducing our carbon footprint as well as saving money and becoming healthier. Also, I'll skip over the simple fact that reductions in our carbon footprint will result in saved money related to health improvements if we had any system of accounting for this substantial benefit, but we don't yet, so I won't count that, keeping to the existing convention that doesn't make any sense. It is an important area for action and change but I will leave that for another time. 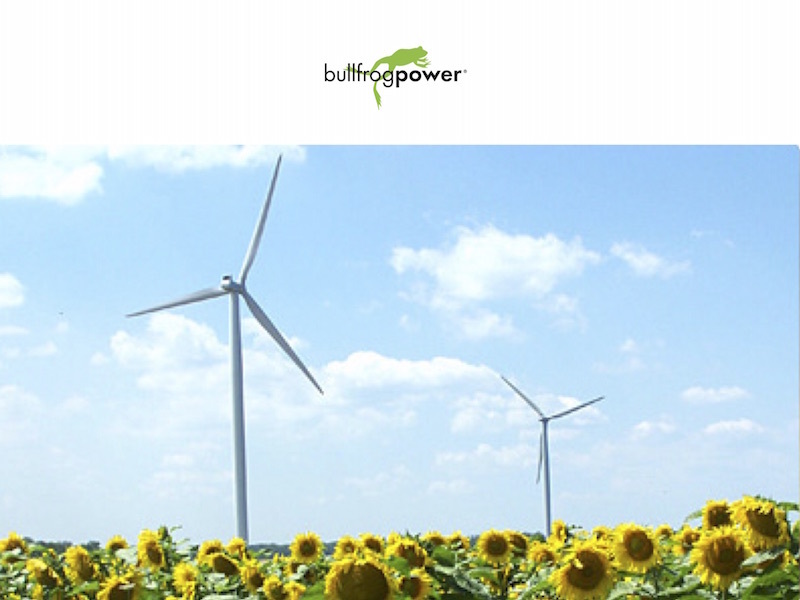 In 2005, along with five other people, we launched a company called Bullfrog Power. It offers home owners and business a choice that simply did not exist in this form before, an alternative carbon free source of electricity and natural gas. As a start, within about five minutes we can all reduce our carbon footprint by switching to 100% renewable energy for both the electricity and green natural gas that we use in our homes and business. Ultimately this simple act of signing up and switching to 100% renewable energy does much more than simply reducing your carbon footprint. It sends a message to your neighbours through the lawn sign or door sticker we send you and the discussions it will initiate...as it will for your business as you show your customers and competitors that you care about the future and are voluntarily reducing your carbon footprint. Of course we all know that by all common sense the switch to non-polluting energy sources, even if it costs a little more in the short term, creates a better future for us all and will save our children money...but we won't get into that by the convention we are irrationally asked to assume. Long ago, in fact as far back for me as 1992 when my son Ian was born, I became acutely aware of the need to reduce our carbon footprint in order to prevent climate change and global warming. In that same year the Union of Concerned Scientists produced their Warning to Humanity, signed by 1,800 scientists including nobel prize winners, clearly stating that we must act quickly to move to 100% renewable energy that is carbon free...and in fact the longer we take in making the transition the harder and worse things will be. Okay, got it...will make every effort to switch to 100% renewable energy and resources as fast as I can. It took some time, planning, saving money, and researching to discover how to make the changes that would significantly reduce our carbon footprint and longer term save us money. Switching to 100% renewable energy became the goal. I read every book on environmentalism, renewable energy, sustainable living and more. I shared what I learned with my family. They still thought I was nuts. As my wife said, if you are so right about putting solar panels on our roof for instance, then why isn't everyone else doing it? Good question. Time to dig into this a little deeper. We were lucky, as we had the chance to tour the Toronto Healthy House in Riverdale, near the housing co-op, just after construction was completed. 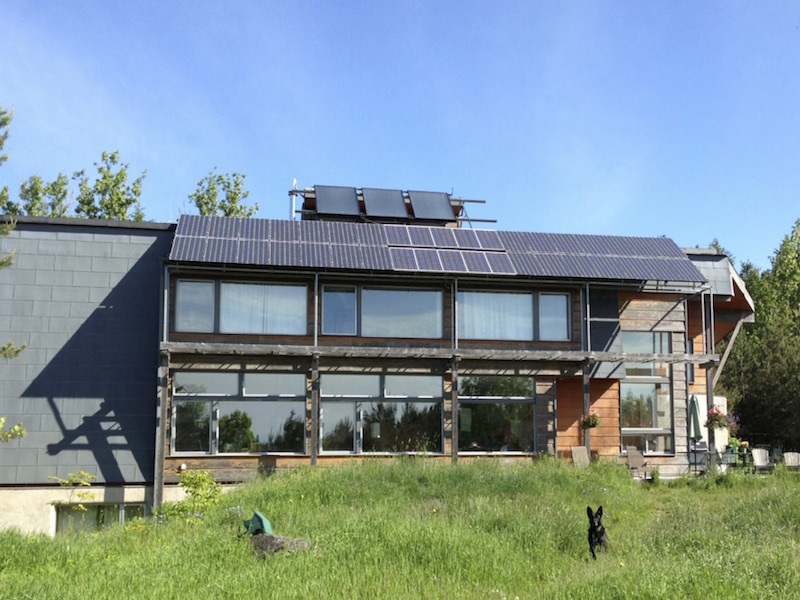 This award-winning sustainably designed house, architected by Martin Liefhebber, showed us how amazing incorporating solar, both thermal and photovoltaic, as an awning to enhance the passive solar design could be. My wife loved the tour and said, okay, now I get it, gorgeous, comfortable, love it, it works, let's do it. 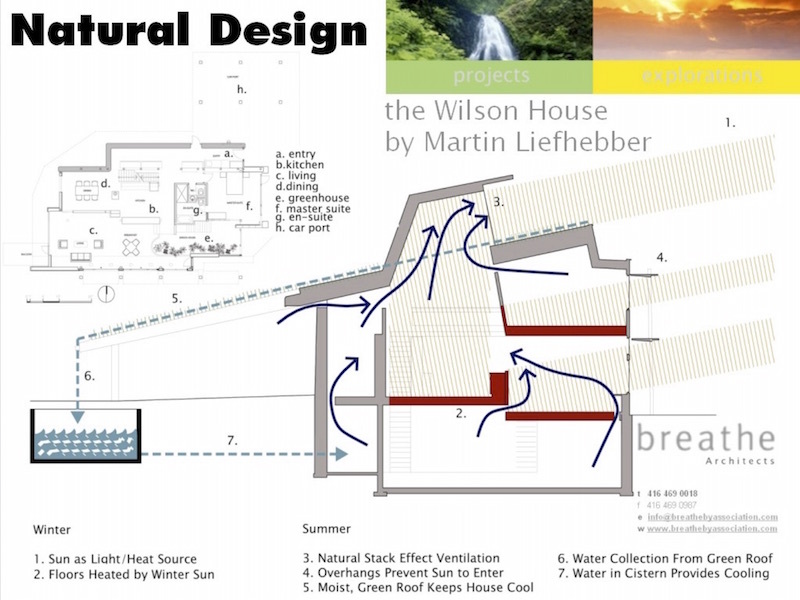 Of course we called Martin Liefhebber as the obvious choice to help us design our future home. To start with the design requirements that we established were strict, zero fossil fuels which in our climate seemed more than a bit extreme. However, we achieved this and much more in the design of our home and you can too. This is where it gets interesting as it is as much about what we DIDN'T do as what we DID do. 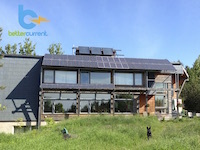 The passive solar design combined with green roof, and "sahara" architecture for air-conditioning allowed us to do without any fossil fuel burning furnace for the winter and without any air conditioner in the summer. This saves us a lot of money, just imagine no gas/oil bill in the winter and a much lower electricity bill in the summer (no air-conditioner humming away your hard earned money). Yes, this is what we started with when we completed construction in 2001. A well insulated, passive solar home that is comfortable all year round and extremely cost effective to operate while at the same time costing about the same as a conventionally built custom home. Everything we applied to the design can be incorporated into your future renovations or if you are lucky enough, your own custom built home. 2001 was a tough year as we all know. For us, there was a significant reduction in our families expected income just as we'd moved into our dream home. Much had to be put on hold as we hunkered down to survive a financial crisis. Looking back, I do believe that the low operating cost of our home significantly helped us, saving us much money, and allowing us to live comfortably without using much energy. Saving carbon and money reduces short and long term risk in my experience. In 2002 we were able to borrow enough money to invest in our first solar photovoltaic system as well as a small wind turbine. Those systems were put in at a time when the utilities weren't really ready for it. So, we ran the meter backwards and saved money on our electricity bills...mostly in the summer, but at times in the winter since the wind blows harder and is more dense then. Of course from a purely return-on-investment basis our payback at electricity prices back then was looking like about seventy years (stay tuned, as this changes as electricity prices have more than doubled since then). We were pioneers and some of us have to do this to break down the barriers, both real and imagined, so that our friends and neighbours can see that it is achievable and it does save the planet from global warming and saves money. I made a documentary video to show everyone everything we'd learned...it is called Natural Living. Canada I have always thought was an "environmental" country...and I think the rest of the world viewed us that way until fairly recently. Perhaps it is mostly driven by our unequalled natural advantages...including so much clean drinking water that a world facing increasing levels of drought can't imagine. However, what seemed incomprehensible to me was that other countries were so much further ahead when it came to implementing solar on their rooftops and wind turbines in many communities. Germany being the prime example. At the time, the thought that world renowned German engineering prowess and intense interest in quality might be the reasons. Our solar installer, Leonard Allen at Solera said, go to Freiburg Germany to learn what they know and see what they've done. So our family did and we made a documentary video of our experience and learning called Solar Village. As it turns out Germany is leading the world towards 100% renewable energy because "it makes sense" as they told me, "we make money", "it pays". I see, so you invest your money and you get more money back they explained...in the community wind farm in the Black Forest visible from town, and on the solar system on what seemed like every other commercial and residential building. This lead me to read every book written by the father of the "solar revolution" Hermann Scheer. His book The Solar Economy especially helped me understand in detail how Germany, using economically sensible policies, that fit within the global financial system worked to help Germans who pay at least twice what we pay in Canada for electricity, to offset this cost by putting solar on their rooftops. 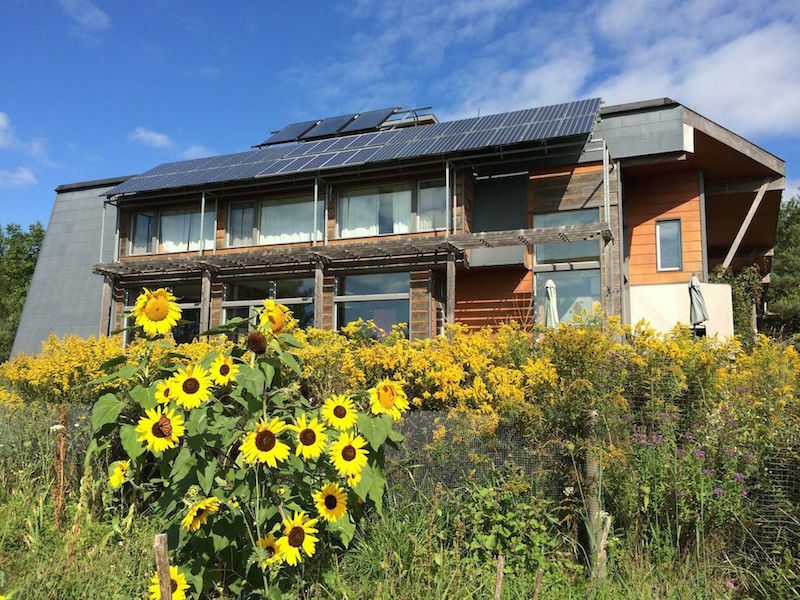 The feed-in tariff system is designed to drive industrial scale development by removing any limits on the scale of deployment while putting all the risk on the developers...in other words the home owners and wind farm developers/community co-ops. It works and has developed the solar and wind industry to such a scale that the tariffs will be able to be removed as the cost of solar and wind is now lower than the price of conventional grid power...we in the industry love to call this point "grid-parity". Now you'd be crazy not to be investing in solar on your rooftop and wind turbines near your community like Germans do. Ontario followed this model starting in 2006, so we upgraded our solar awning system with an additional 1.2 kW solar array that, at the electricity rate at the time, would have seen a 20 year return-on-investment. After Herman Scheer spoke at the World Wind Energy Conference in Kingston Ontario in 2008, and the newly minted Minister of Energy, George Smitherman who also spoke, was invited to Germany to learn about their transformation. The Ontario Green Energy Act and the feed-in tariff were born. Of course not everything was perfectly implemented here in Ontario but the program does provide a great way for home owners and business owners to save money by implementing solar and wind power systems. We upgraded our solar system when the first MicroFIT program for solar was announced. We added 5 kW of solar photovoltaic as an awning as well as a large solar thermal hot water heating system. Our return-on-investment for the photovoltaic system is now about eight years and around six years for the solar thermal (the three panels on top in the picture below). Of course, if we update our view of the original solar system we put in back in 2002, the original 70 year return based on electricity rates back then is now down to about 30 years and dropping as grid based electricity rates have more than doubled since then. Given that these panels could last 40+ years we've got a great investment, we are saving money, and we are reducing our carbon footprint. You can too. Call a few reputable solar providers to get quotes and pick one with good references. We invested using a home equity line of credit and by building in early summer the monthly payments are more than paid for by the income generated by the solar system...making it cash flow positive from day one. Of course there are always risks that you need to be aware of but the fact that solar photovoltaics have no moving parts as they generate electricity give some sense of security. Then think about it. On top of saving money and your carbon reductions, when combined with your neighbours who will follow your lead, you will improve your communities economic and climate resilience. There are prices on carbon in various places. There can be no doubt there is a cost, so let us say this price is $50/tonne (in reality it is no doubt much more and increasing with each passing day...but let us be conservative). Then what? How much are you really saving when you switch to Bullfrog Power and put solar on your rooftop as a home or business owner? How much is your child's future worth? You save money and reduce your carbon footprint the most, and make the most difference in the world by acting now, as in today, because time is the other factor in reducing carbon and saving money...sooner has much more impact. Join me and many others who have done the same. Lastly we all need to, I think, do more by doing less. By implementing more renewable energy we'll reduce our carbon footprints and save money. My latest project is one that will see the final frontier for solar, the ability to use the generated electricity day and night, fulfilled. I've got a project called Better Current where I'll be adding another solar array to the awning on my house but this time it'll charge up a lithium ion battery system and then use the DC electricity so generated directly in the most efficient way possible to power DC devices like mobile phones, laptops and LED lighting (instead of through an AC DC adapter which we all currently use to convert AC grid electricity to the DC type required by these devices, and by going DC direct we could save up to 25% or more that is currently wasted in this conversion - it is in an interesting story often referred to as "Edison's Revenge", as in the inventor of electricity Edison who had promoted DC in the early days - check it out in this Scientific American article). If you made it this far wow! Would love to hear from you and answer any questions you might still have. Stay tuned for more soon.